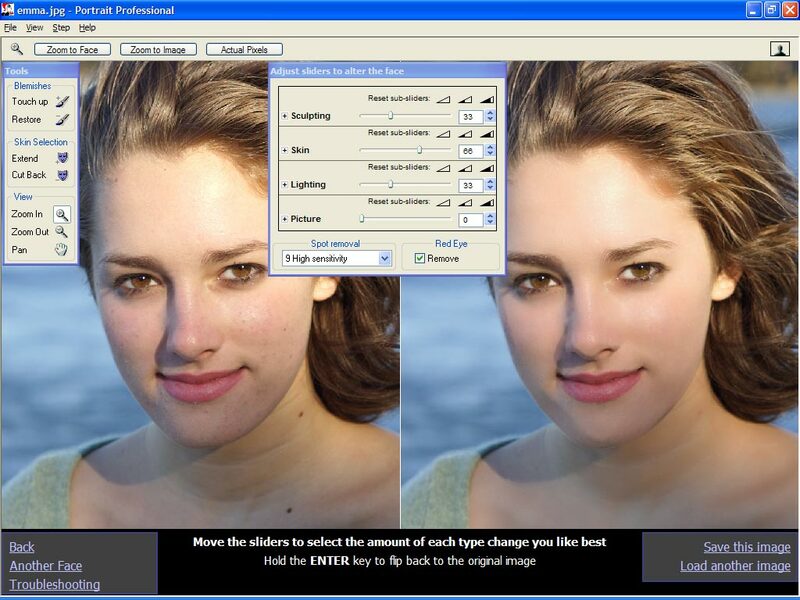 Portrait Professional is new portrait airbrushing software that has been “trained” in human beauty. Exceptionally fast and easy to use, and capable of the highest quality touch up, it lets you improve your photos instantly, just by moving sliders. The software has been shown hundreds of examples of beautiful photographs of human faces, and using sophisticated statistical techniques, it has learnt how to subtly enhance photographs to make them more beautiful. It is a painting program that will not require any artistic skill. All you have to do is identify some points on the photo – such as the corners of the eyes, and the edges of the lips – and the software then calculates how to make your subject look their absolute best. With this easy photo editing software, it’s incredibly fast for any photographer to enhance the face and hair of the subject. You can give your photographs an automatic “celebrity makeover” correcting the lighting and makeup, removing blemishes and generally making your subject look as good as possible. Portrait Professional enhances people in the same way that good lighting and perfect makeup is used to make someone look more attractive. The software lets anyone look as good as a celebrity in a magazine. The software has been trained in all aspects of beauty. It allows you to choose how much to enhance the lighting, the skin texture and even how many wrinkles to remove. It even allows you subtly re-sculpt the face to make your subject look as good as possible. For professionals, Portrait Professional Studio is a must. Run this easy photo editing software as a Photoshop plugin, and you can touch up your portraits quickly and easily without having to run separate programs. Portrait Professional Studio also handles RAW files directly, keeping your images in the highest quality.